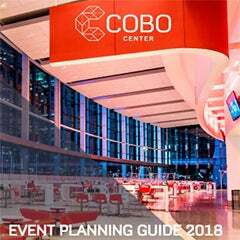 Attending an event at Cobo Center? You can view floor plans, hotel information, area restaurant information, and frequently asked questions here. Need directions? View a detailed map and get detailed directions as well. Cobo Center offers convenience, comfort, service reliability and fine food. Our elegant banquet rooms and 100 meeting rooms totaling 255,000 square feet of meeting space equip Cobo Center to accommodate capacities from 30 to 10,000. Cobo Center’s flexible exhibit hall configurations ensures prime space for all exhibitors and ease of event flow for attendees. Our exhibitor resources can help you save time and money, which add up to great business opportunities once showtime rolls around. DETROIT—March 2, 2011—The Detroit Regional Convention Facility Authority (DRCFA) today unveiled a three-year, $221 million plan for the reinvention of Cobo Conference & Exhibition Center, Metro Detroit’s regional convention facility. 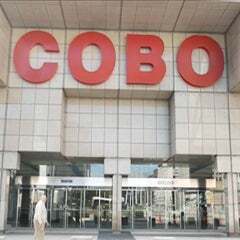 The bond-financed project is Phase III of a multi-year strategic plan to return Cobo Center to its historic role as one of North America’s premier meeting and convention venues. In creating its strategic plan, the DRCFA focused on restoring Cobo Center’s competitiveness in the national meeting and convention landscape, revitalizing Cobo Center with an updated image and improving Cobo Center’s financial viability through increased revenue opportunities and decreased costs. • The reinvention of Cobo Arena as a 40,000-square foot ballroom with supporting meeting, pre-function and back-of-house spaces. This new ballroom will feature a glass wall and open-air terrace facing Hart Plaza and Detroit’s downtown to the east, as well as pre-function space with a panoramic view of the Detroit River and the international border with Canada to the south. • The creation of a new “signature space” for Cobo Center in the form of a spacious threestory glass atrium that links the main floor of the venue with a new entrance facing the Detroit River, bringing the lower-level exhibition space more naturally into the flow of a meeting or convention and linking Cobo Center more fully to Detroit’s revitalized riverfront. • Significant renovation to the building’s primary façade on the east side facing downtown Detroit. The primary element will be a high-tech “media mesh” that will function as a giant digital signboard welcoming conventions and guests to Detroit and to the new Cobo Center. Additional elements include a new entrance to the recently-developed food court, improved protection from the elements for arriving guests and increased use of glass in exterior walls to tie events at Cobo Center more closely into the surrounding city. • Parking enhancements, including a 20% parking space increase. Work will begin immediately on Phase III activities, with construction planned around existing commitments at Cobo Center so as not to disrupt customer events or access. All major project elements are planned to be complete by the 2014 North American International Auto Show in January, with full project completion expected by December of 2014. 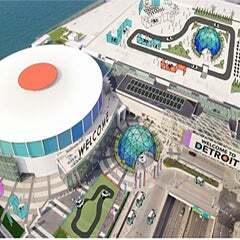 The Detroit Regional Convention Facility Authority (DRCFA) was created in 2009 to operate Cobo Convention and Exhibition Center in Detroit under long-term lease from the City of Detroit. The DRCFA Board of Directors is comprised of five representatives selected by the Governor of Michigan, the Mayor of Detroit, and the county executives of Wayne, Oakland and Macomb Counties. The DRCFA receives funding from revenues at Cobo Center as well as support from the state’s Convention Fund. For more information, visit the Authority’s Web site at www.DRCFA.org.